Expression error: Unrecognised word "north". The Aral Sea (Kazakh: Арал Теңізі Aral Teñizi; Uzbek: Orol dengizi; Russian: Ара́льское море, tr. Aral'skoye Morye, IPA: [ɐˈralʲskəjə ˈmorʲɪ]; Template:Lang-tg Bahri Aral; older Persian: دریاچه خوارزم Daryâche Khârazm; Mongolian: Арал тэнгис) was an endorheic lake lying between Kazakhstan (Aktobe and Kyzylorda Regions) in the north and Uzbekistan (Karakalpakstan autonomous region) in the south. The name roughly translates as "Sea of Islands", referring to over 1,100 islands that once dotted its waters; in the Turkic languages aral means "island, archipelago". The Aral Sea drainage basin encompasses Uzbekistan and parts of Tajikistan, Turkmenistan, Kyrgyzstan, Kazakhstan, and Afghanistan. Formerly one of the four largest lakes in the world with an area of 68,000 km2 (26,300 sq mi), the Aral Sea has been steadily shrinking since the 1960s after the rivers that fed it were diverted by Soviet irrigation projects. By 2007, it had declined to 10% of its original size, splitting into four lakes – the North Aral Sea, the eastern and western basins of the once far larger South Aral Sea, and one smaller lake between the North and South Aral Seas. By 2009, the southeastern lake had disappeared and the southwestern lake had retreated to a thin strip at the western edge of the former southern sea; in subsequent years, occasional water flows have led to the southeastern lake sometimes being replenished to a small degree. Satellite images taken by NASA in August 2014 revealed that for the first time in modern history the eastern basin of the Aral Sea had completely dried up. The eastern basin is now called the Aralkum Desert. In an ongoing effort in Kazakhstan to save and replenish the North Aral Sea, a dam project was completed in 2005; in 2008, the water level in this lake had risen by 12 m (39 ft) compared to 2003. Salinity has dropped, and fish are again found in sufficient numbers for some fishing to be viable. The maximum depth of the North Aral Sea is 42 m (138 ft) (as of 2008). The shrinking of the Aral Sea has been called "one of the planet's worst environmental disasters". The region's once-prosperous fishing industry has been essentially destroyed, bringing unemployment and economic hardship. The Aral Sea region is also heavily polluted, with consequential serious public health problems. The Aral Sea formed about 5.5 million years ago due to a fall in sea level and the uplift of the Elburz and Caucasus Mountains. Geographer Dr. Nick Middleton believes that the Amu Darya did not flow into the shallow depression that now forms the Aral Sea until the beginning of the Holocene, and it is known that the Amu Darya flowed into the Caspian Sea via the Uzboy channel until the Holocene. The Syr Darya formed a large lake in the Kyzyl Kum during the Pliocene known as the Mynbulak depression. Russian naval presence on the Aral Sea started in 1847, with the founding of Raimsk, which was soon renamed Aralsk, near the mouth of the Syr Darya. Soon, the Imperial Russian Navy started deploying its vessels on the sea. Owing to the Aral Sea basin not being connected to other bodies of water, the vessels had to be disassembled in Orenburg on the Ural River, shipped overland to Aralsk (presumably by a camel caravan), and then reassembled. The first two ships, assembled in 1847, were the two-masted schooners named Nikolai and Mikhail. The former was a warship; the latter was a merchant vessel meant to serve the establishment of the fisheries on the great lake. In 1848, these two vessels surveyed the northern part of the sea. In the same year, a larger warship, the Constantine, was assembled. Commanded by Lt. Alexey Butakov (Алексей Бутаков), the Constantine completed the survey of the entire Aral Sea over the next two years. The exiled Ukrainian poet and painter Taras Shevchenko participated in the expedition, and painted a number of sketches of the Aral Sea coast. For the navigation season of 1851, two newly built steamers arrived from Sweden, again by caravan from Orenburg. As the geological surveys had found no coal deposits in the area, the Military Governor-General of Orenburg Vasily Perovsky ordered "as large as possible supply" of saxaul (Haloxylon ammodendron, a desert shrub, akin to the creosote bush) to be collected in Aralsk for use by the new steamers. Unfortunately, saxaul wood did not turn out a very suitable fuel, and in the later years, the Aral Flotilla was provisioned, at substantial cost, by coal from the Donbass. The map of 'Aral' Sea of 1853 published for the Journal of the Royal Geographical Society in London. 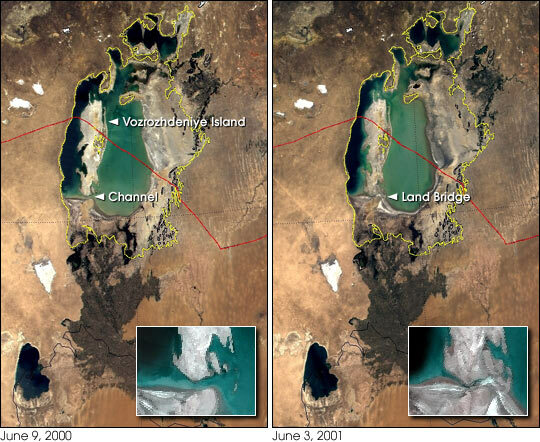 Satellite images show the changing water levels in the Aral Sea from 2000 to 2011. The terms "mistake of nature" and "useless evaporator" were used to describe the Aral Sea by Aleksandr Voeikov, a Russian climatologist. In the early 1960s, the Soviet government decided the two rivers that fed the Aral Sea, the Amu Darya in the south and the Syr Darya in the east, would be diverted to irrigate the desert, in an attempt to grow rice, melons, cereals, and cotton. This was part of the Soviet plan for cotton, or "white gold", to become a major export. This temporarily succeeded, and in 1988, Uzbekistan was the world's largest exporter of cotton. Of the 47,750 km of interfarm irrigation channels in the basin, only 28% have anti-infiltration linings. Only 77% of farm intakes have flow gauges, and of the 268,500 km of onfarm channels, only 21% have anti-infiltration linings, which retain on average 15% more water than unlined channels. By 1960, between 20 and 60 km3 (4.8 and 14 cu mi) of water were going each year to the land instead of the sea. Most of the sea's water supply had been diverted, and in the 1960s, the Aral Sea began to shrink. From 1961 to 1970, the Aral's level fell at an average of 20 cm (7.9 in) a year; in the 1970s, the average rate nearly tripled to 50–60 cm (20–24 in) per year, and by the 1980s, it continued to drop, now with a mean of 80–90 cm (31–35 in) each year. The rate of water usage for irrigation continued to increase; the amount of water taken from the rivers doubled between 1960 and 2000, and cotton production nearly doubled in the same period. The disappearance of the lake was no surprise to the Soviets; they expected it to happen long before. As early as 1964, Aleksandr Asarin at the Hydroproject Institute pointed out that the lake was doomed, explaining, "It was part of the five-year plans, approved by the council of ministers and the Politburo. Nobody on a lower level would dare to say a word contradicting those plans, even if it was the fate of the Aral Sea." The reaction to the predictions varied. Some Soviet experts apparently considered the Aral to be "nature's error", and a Soviet engineer said in 1968, "it is obvious to everyone that the evaporation of the Aral Sea is inevitable." On the other hand, starting in the 1960s, a large-scale project was proposed to redirect part of the flow of the rivers of the Ob basin to Central Asia over a gigantic canal system. Refilling of the Aral Sea was considered as one of the project's main goals. However, due to its staggering costs and the negative public opinion in Russia proper, the federal authorities abandoned the project by 1986. From 1960 to 1998, the sea's surface area shrank by about 60%, and its volume by 80%. In 1960, the Aral Sea had been the world's fourth-largest lake, with an area around 68,000 km2 (26,000 sq mi) and a volume of 1,100 km3 (260 cu mi); by 1998, it had dropped to 28,687 km2 (11,076 sq mi) and eighth largest. Over the same time period, its salinity increased from about 10 g/l to about 45 g/l. In 1987, the continuing shrinkage split the lake into two separate bodies of water, the North Aral Sea (the Lesser Sea, or Small Aral Sea) and the South Aral Sea (the Greater Sea, or Large Aral Sea) In June 1991, Uzbekistan gained independence from the Soviet Union. Craig Murray, a UK ambassador to Uzbekistan in 2002, described the independence as a way for Islam Karimov to consolidate his power rather than a move away from a Soviet-style economy and its philosophy of exploitation of the land. Murray attributes the shrinkage of the Aral Sea in the 1990s to Karimov's cotton policy. The government maintained a massive irrigation system which Murray described as massively wasteful, with most of the water being lost through evaporation before reaching the cotton. Crop rotation was not used, and the depleted soil and monoculture required massive quantities of pesticides and fertilizer. The runoff from the fields washed these chemicals into the shrinking sea, creating severe pollution and health problems. As the water supply of the Aral Sea decreased, the demand for cotton increased and the Soviet reacted by pouring more pesticides and fertilizer onto the land. Murray compared the system to the slavery system in the pre-Civil War United States; forced labor was used, and profits were siphoned off by the powerful and well-connected. Murray contrasts this to Kazakhstan, where the cotton industry had been privatized. By summer 2003, the South Aral Sea was vanishing faster than predicted. In the deepest parts of the sea, the bottom waters were saltier than the top, and not mixing. Thus, only the top of the sea was heated in the summer, and it evaporated faster than would otherwise be expected. In 2003, the South Aral further divided into eastern and western basins. In 2004, the Aral Sea's surface area was only 17,160 km2 (6,630 sq mi), 25% of its original size, and a nearly five-fold increase in salinity had killed most of its natural flora and fauna. By 2007, the sea's area had further shrunk to 10% of its original size, and the salinity of the remains of the South Aral had increased to levels in excess of 100 g/l. (By comparison, the salinity of ordinary seawater is typically around 35 g/l; the Dead Sea's salinity varies between 300 and 350 g/l.) 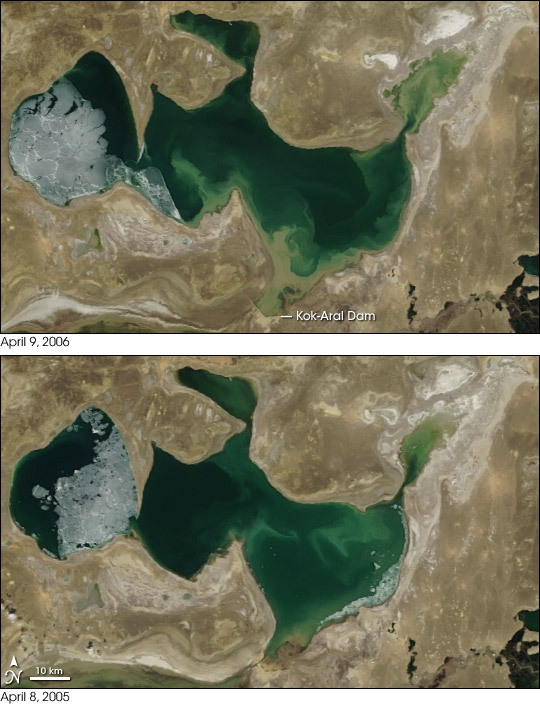 The decline of the North Aral has now been partially reversed following construction of a dam (see below), but the remnants of the South Aral continue to disappear and its drastic shrinkage has created the Aralkum, a desert on the former lake bed. The inflow of groundwater into the South Aral Sea will probably not in itself be able to stop the desiccation, especially without a change in irrigation practices. This inflow of about 4 km3 (0.96 cu mi) per year is larger than previously estimated. The groundwater originates in the Pamirs and Tian Shan Mountains and finds its way through geological layers to a fracture zone at the bottom of the Aral. The ecosystems of the Aral Sea and the river deltas feeding into it have been nearly destroyed, not least because of the much higher salinity. The receding sea has left huge plains covered with salt and toxic chemicals – the results of weapons testing, industrial projects, and pesticides and fertilizer runoff – which are picked up and carried away by the wind as toxic dust and spread to the surrounding area. As a result, the land around the Aral Sea is heavily polluted, and the people living in the area are suffering from a lack of fresh water and health problems, including high rates of certain forms of cancer and lung diseases. Respiratory illnesses, including tuberculosis (most of which is drug resistant) and cancer, digestive disorders, anaemia, and infectious diseases are common ailments in the region. Liver, kidney, and eye problems can also be attributed to the toxic dust storms. These dust storms also contributed to the lack of fresh water since the salt melted the glaciers faster and not enough moisture was in the air to help replace them. The dust storms increased the melting levels for the glaciers by 12 times the normal rate. Health concerns associated with the region are a cause for an unusually high fatality rate amongst vulnerable parts of the population. The child mortality rate is 75 in every 1,000 newborns and maternity death is 12 in every 1,000 women. A overuse of pesticides on crops was one of the contributing factors to this. To get their crops to grow their pesticide use would have to exceed health standards and could be twenty times more than the national average. Crops in the region are destroyed by salt being deposited onto the land and are flushed with water at least 4 times a day to try and remove the salinity from the soils. Vast salt plains exposed by the shrinking Aral have produced dust storms, making regional winters colder and summers hotter. The Aral Sea fishing industry, which in its heyday had employed some 40,000 and reportedly produced one-sixth of the Soviet Union's entire fish catch, has been devastated, and former fishing towns along the original shores have become ship graveyards. The town of Moynaq in Uzbekistan had a thriving harbor and fishing industry that employed about 30,000 people; now it lies miles from the shore. Fishing boats lie scattered on the dry land that was once covered by water; many have been there for 20 years. The only significant fishing company left in the area has its fish shipped from the Baltic Sea, thousands of kilometers away. Also destroyed is the muskrat-trapping industry in the deltas of the Amu Darya and Syr Darya, which used to yield as many as 500,000 pelts a year. In January 1994, Kazakhstan, Uzbekistan, Turkmenistan, Tajikistan, and Kyrgyzstan signed a deal to pledge 1% of their budgets to help the sea recover. In March 2000, UNESCO presented their "Water-related vision for the Aral Sea basin for the year 2025" at the second World Water Forum in The Hague. This document was criticized for setting unrealistic goals and for giving insufficient attention to the interests of the area immediately around the former lakesite, implicitly giving up on the Aral Sea and the people living on the Uzbek side of the lake. By 2006, the World Bank's restoration projects, especially in the North Aral, were giving rise to some unexpected, tentative relief in what had been an extremely pessimistic picture. The first phase of the plan effectively began with the first involvement from the World Bank in 1992, and was in operation until 1997. It was ineffectual for a number of reasons, but mainly because it was focused on improving directly the land around the Aral Sea, whilst not intervening in the water usage upstream. There was considerable concern amongst the Central Asian governments, which realised the importance of the Aral Sea in the ecosystem and the economy of Central Asia, and they were prepared to cooperate, but they found it difficult to implement the procedures of the plan. This is due in part to a lack of co-operation among the affected people. The water flowing into the Aral Sea has long been considered an important commodity, and trade agreements have been made to supply the downstream communities with water in the spring and summer months for irrigation. In return, they supply the upstream countries with fuel during the winter, instead of storing water during the warm months for hydroelectric purposes in winter. However, very few legal obligations are binding these contracts, particularly on an international stage. Phase Two of the Aral Sea Basin program followed in 1998 and ran for five years. The main shortcomings of phase two were due to its lack of integration with the local communities involved. The scheme was drawn up by the World Bank, government representatives, and various technical experts, without consulting those who would be affected. An example of this was the public awareness initiatives, which were seen as propagandist attempts by people with little care or understanding of their situation. These failures have led to the introduction of a new plan, funded by a number of institutions, including the five countries involved and the World Bank. In 1997, a new plan was conceived which would continue with the previous restoration efforts of the Aral Sea. The main aims of this phase are to improve the irrigation systems currently in place, whilst targeting water management at a local level. The largest project in this phase is the North Aral Sea Project, a direct effort to recover the northern region of the Aral Sea. The North Aral Sea Project’s main initiative is the construction of a dam across the Berg Strait, a deep channel which connects the North Aral Sea to the South Aral Sea. The Kok-Aral Dam is eight miles long and has capacity for over 29 cubic kilometres of water to be stored in the North Aral Sea, whilst allowing excess to overflow into the South Aral Sea. Comparison of the North Aral Sea in 2000 and 2011. Work is being done to restore in part the North Aral Sea. Irrigation works on the Syr Darya have been repaired and improved to increase its water flow, and in October 2003, the Kazakh government announced a plan to build Dike Kokaral, a concrete dam separating the two halves of the Aral Sea. Work on this dam was completed in August 2005; since then, the water level of the North Aral has risen, and its salinity has decreased. As of 2006, some recovery of sea level has been recorded, sooner than expected. "The dam has caused the small Aral's sea level to rise swiftly to 38 m (125 ft), from a low of less than 30 m (98 ft), with 42 m (138 ft) considered the level of viability." Economically significant stocks of fish have returned, and observers who had written off the North Aral Sea as an environmental disaster were surprised by unexpected reports that, in 2006, its returning waters were already partly reviving the fishing industry and producing catches for export as far as Ukraine. The restoration reportedly gave rise to long-absent rain clouds and possible microclimate changes, bringing tentative hope to an agricultural sector swallowed by a regional dustbowl, and some expansion of the shrunken sea. "The sea, which had receded almost 100 km (62 mi) south of the port-city of Aralsk, is now a mere 25 km (16 mi) away." The Kazakh Foreign Ministry stated that "The North Aral Sea's surface increased from 2,550 square kilometers (980 sq mi) in 2003 to 3,300 square kilometers (1,300 sq mi) in 2008. The sea's depth increased from 30 meters (98 ft) in 2003 to 42 meters (138 ft) in 2008." Now, a second dam is to be built based on a World Bank loan to Kazakhstan, with the start of construction initially slated for 2009 and postponed to 2011, to further expand the shrunken Northern Aral, eventually reducing the distance to Aralsk to only 6 km (3.7 mi). Then, it was planned to build a canal spanning the last 6 km, to reconnect the withered former port of Aralsk to the sea. Kazakhstan has made major efforts to revive the Aral Sea. The eight-mile Kok-Aral dam, completed in 2005 by Kazakhstan and financed by World Bank, allows water of the Syr Darya to accumulate and helps restore delta and riverine wetland ecosystems in the Northern Sea. Since then, the northern part of the lake, which lies in Kazakhstan, is slowly reviving. The Aral Sea in August 2010, with part of the eastern basin reflooded from heavy snowmelt. The Aral Sea in September 2011, the west basin has gained some water, and the east basin and North Aral Sea have lost water. The South Aral Sea, half of which lies in Uzbekistan, was largely abandoned to its fate. Only excess water from the North Aral Sea is now periodically allowed to flow into the largely dried-up South Aral Sea through a sluice in the dike. Discussions had been held on recreating a channel between the somewhat improved North and the desiccated South, along with uncertain wetland restoration plans throughout the region, but political will is lacking. Uzbekistan shows no interest in abandoning the Amu Darya river as an abundant source of cotton irrigation, and instead is moving toward oil exploration in the drying South Aral seabed. Attempts to mitigate the effects of desertification include planting vegetation in the newly exposed seabed; however, intermittent flooding of the eastern basin is likely to prove problematic for any development. Redirecting what little flow there is from the Amu Darya to the western basin may salvage fisheries there while relieving the flooding of the eastern basin. The International Fund for Saving the Aral Sea (IFAS) was developed on March 23, 1993 by the ICWC to raise funds for the projects under Aral Sea Basin programs. The IFAS was meant to finance programs to save the sea and improve on environmental issues associated with the basin’s drying. This program has had some success with joint summits of the countries involved and finding funding from the World Bank to implement projects; however, it faces many challenges, such as enforcement and slowing progress. “Rebirth” Island joins the mainland in mid-2001. Vozrozhdeniya, also known as "Resurrection Island", is a former island of the Aral Sea or South Aral Sea. Due to the ongoing shrinkage of the Aral, it became first a peninsula in mid-2001 and finally part of the mainland. Other islands like Kokaral and Barsa-Kelmes shared a similar fate. Since the disappearance of the Southeast Aral in 2008, Vozrozhdeniya effectively no longer exists as a distinct geographical feature. The area is now shared by Kazakhstan and Uzbekistan. In 1948, a top-secret Soviet bioweapons laboratory was established on the island, in the center of the Aral Sea which is now disputed territory between Kazakhstan and Uzbekistan. The exact history, functions and current status of this facility are still unclear, but bio-agents tested there included Bacillus anthracis, Coxiella burnetii, Francisella tularensis, Brucella suis, Rickettsia prowazekii, Variola major (smallpox), Yersinia pestis, botulinum toxin, and Venezuelan equine encephalitis virus. In 1971, weaponized smallpox from the island reached a nearby ship, which then allowed the virus to spread to the city of Aral. Ten people there were infected, of whom 3 died, and a massive vaccination effort involving 50,000 inhabitants ensued (see Aral smallpox incident). The bioweapons base was abandoned in 1992 following the disintegration of the Soviet Union the previous year. Scientific expeditions proved this had been a site for production, testing and later dumping of pathogenic weapons. In 2002, through a project organized by the United States and with Uzbekistan's assistance, 10 anthrax burial sites were decontaminated. According to the Kazakh Scientific Center for Quarantine and Zoonotic Infections, all burial sites of anthrax were decontaminated. Ergash Shaismatov, the deputy prime minister of Uzbekistan, announced on August 30, 2006, that the Uzbek government and an international consortium consisting of state-run Uzbekneftegaz, LUKoil Overseas, Petronas, Korea National Oil Corporation, and China National Petroleum Corporation signed a production-sharing agreement to explore and develop oil and gas fields in the Aral Sea, saying, "The Aral Sea is largely unknown, but it holds a lot of promise in terms of finding oil and gas. There is risk, of course, but we believe in the success of this unique project." The consortium was created in September 2005. As of June 1, 2010, 500,000 cubic meters of gas had been extracted from the region at a depth of 3 km. The plight of the Aral coast was portrayed in the 1989 film Psy ("Dogs") by Soviet director Dmitri Svetozarov. The film was shot on location in an actual ghost town located near the Aral Sea, showing scenes of abandoned buildings and scattered vessels. In 2000, the MirrorMundo foundation produced a documentary film called Delta Blues about the problems arising from the drying up of the sea. In June 2007, BBC World broadcast a documentary called Back From The Brink? made by Borna Alikhani and Guy Creasey that showed some of the changes in the region since the introduction of the Aklak Dam. In October 2013, Al Jazeera produced a documentary film called People of The Lake, directed by Ensar Altay, describing the current situation. ^ "DRAINAGE BASIN OF THE ARAL SEA AND OTHER TRANSBOUNDARY SURFACE WATERS IN CENTRAL ASIA". 2005. https://www.unece.org/fileadmin/DAM/env/water/blanks/assessment/aral.pdf. Retrieved 4 Feb 2016. ^ a b Philip Micklin; Nikolay V. Aladin (March 2008). "Reclaiming the Aral Sea". Scientific American. http://www.sciam.com/article.cfm?id=reclaiming-the-aral-sea&sc=rss. Retrieved May 17, 2008. ^ "Satellite image, August 16, 2009 (click on "2009" and later links)". http://earthobservatory.nasa.gov/Features/WorldOfChange/aral_sea.php. ^ Liston, Enjoli (1 October 2014). "Satellite images show Aral Sea basin 'completely dried'". The Guardian (London: Guardian News and Media Limited). http://www.theguardian.com/world/2014/oct/01/satellite-images-show-aral-sea-basin-completely-dried?CMP=fb_gu. Retrieved 2014-10-01. ^ "Aral Sea Reborn". Al Jazeera. July 21, 2012. http://www.aljazeera.com/programmes/earthrise/2012/07/201271912543306106.html. Retrieved January 6, 2013. ^ a b "The Kazakh Miracle: Recovery of the North Aral Sea". Environment News Service. 2008-08-01. Archived from the original on April 12, 2010. https://web.archive.org/web/20100412135936/http://www.ens-newswire.com/ens/aug2008/2008-08-01-01.asp. Retrieved 2010-03-22. ^ Daily Telegraph (2010-04-05). "Aral Sea 'one of the planet's worst environmental disasters'". The Daily Telegraph (London). Archived from the original on April 8, 2010. https://web.archive.org/web/20100408214552/http://www.telegraph.co.uk/earth/earthnews/7554679/Aral-Sea-one-of-the-planets-worst-environmental-disasters.html. Retrieved 2010-05-01. ^ "About travel to Aral Sea". https://www.people-travels.com/aral-sea-tours/. Retrieved 2016-08-29. ^ a b Valikhanov, Chokan Chingisovich; Venyukov, Mikhail Ivanovich (1865). The Russians in Central Asia: their occupation of the Kirghiz steppe and the line of the Syr-Daria: their political relations with Khiva, Bokhara, and Kokan: also descriptions of Chinese Turkestan and Dzungaria. Translated by John Michell, Robert Michell. London: Edward Stanford. pp. 324–329. https://archive.org/details/cu31924023159621. ^ Rich, David Alan (1998). The Tsar's colonels: professionalism, strategy, and subversion in late Imperial Russia. Harvard University Press. p. 247. ISBN 0-674-91111-3. https://books.google.com/?id=lF42jb5Fg4cC. ^ "Soviet cotton threatens a region's sea - and its children". New Scientist. November 18, 1989. http://www.newscientist.com/article/mg12416910.800-soviet-cotton-threatens-a-regions-sea--and-its-children.html. Retrieved January 27, 2010. ^ USDA-Foreign Agriculture Service (2013). "Cotton Production Ranking". National Cotton Council of America. http://www.cotton.org/econ/cropinfo/cropdata/rankings.cfm. Retrieved Oct 14, 2013. ^ "ca-water.net, a knowledge base for projects in the Central Asia". 2003. http://www.cawater-info.net/aral/aral0_e.htm. Retrieved November 2010. ^ a b Michael Wines (2002-12-09). "Grand Soviet Scheme for Sharing Water in Central Asia Is Foundering". The New York Times. http://query.nytimes.com/gst/fullpage.html?res=9D03E4DA1F3BF93AA35751C1A9649C8B63&sec=&spon=&pagewanted=all. Retrieved 2008-03-08. ^ Bissell, Tom (2002). Eternal Winter: Lessons of the Aral Sea Disaster. Harper's. pp. 41–56. ^ Glantz, Michael H. (1999). Creeping Environmental Problems and Sustainable Development in the Aral Sea.... Cambridge, New York: Cambridge University Press. p. 174. ISBN 0-521-62086-4. https://books.google.com/?id=2YXnBxZg7c4C. Retrieved May 17, 2008. ^ Craig Murray (2007). Dirty Diplomacy. Scribner. ^ Philip P. Mickin (1988). "Desiccation of the Aral Sea". CIESIN, Coulmbia University. http://www.ciesin.org/docs/006-238/006-238.html. Retrieved January 6, 2013. ^ a b c d "The Aral Sea Crisis". Thompson, Columbia University. http://www.columbia.edu/~tmt2120/impacts%20to%20life%20in%20the%20region.htm. Retrieved January 6, 2013. ^ "Aral Sea - Aral Sea". Archived from the original on 2009-03-16. https://web.archive.org/web/20090316062917/http://enrin.grida.no/aral/aralsea/english/arsea/arsea.htm. ^ Godwin O. P. Obasi (February 11, 2003). "Challenges and Opportunities in Water Resource Management" (PDF). Lecture at the 93rd Annual Meeting of the American Meteorological Society. World Meteorological Organization. http://www.wmo.int/web/Press/SG230E.pdf. ^ "Aral Sea". Encyclopædia Britannica. Encyclopædia Britannica Online. 2007. http://concise.britannica.com/ebc/article-9355673/Aral-Sea. Retrieved May 17, 2008. ^ Whish-Wilson, Phillip (2002). "The Aral Sea environmental health crisis" (PDF). Journal of Rural and Remote Environmental Health 1 (2). Retrieved on May 17, 2008. ^ "Uzbekistan: Moynaq village faces the Aral Sea disaster". UNICEF. http://www.unicef.org/ceecis/reallives_3304.html. ^ "Aral Sea and sustainable development. [Water Sci Technol. 2003] - PubMed - NCBI". Ncbi.nlm.nih.gov. 2013-03-25. http://www.ncbi.nlm.nih.gov/pubmed/12793660. Retrieved 2013-06-12. ^ Olli Varis. "Resources: Curb vast water use in central Asia. [Nature Vol 514(7520)"]. http://www.nature.com/news/resources-curb-vast-water-use-in-central-asia-1.16017. ^ Ed Ring (2004-09-27). "Release the Rivers: Let the Volga & Ob Refill the Aral Sea". Ecoworld. Archived from the original on April 29, 2008. http://www.ecoworld.com/Home/Articles2.cfm?TID=354. Retrieved May 17, 2008. ^ "Aral Sea Refill: Seawater Importation Macroproject". The Internet Encyclopedia of Science. June 29, 2008. http://www.daviddarling.info/encyclopedia/A/Aral_Sea_refill.html. Retrieved 2009-10-08. ^ "Water-related vision for the Aral Sea Basin for the year 2025; 2000" (PDF). http://unesdoc.unesco.org/images/0012/001262/126259mo.pdf. Retrieved 2013-06-12. ^ "(Nederland) - UNESCO promotes unsustainable development in Central Asia". Indymedia NL. http://indymedia.nl/nl/2007/02/42459.shtml. Retrieved July 18, 2009. ^ "A Witch's Brew". BBC News. July 2006. Archived from the original on December 13, 2007. https://web.archive.org/web/20071213020010/http://news.bbc.co.uk/2/hi/programmes/documentary_archive/5218248.stm. Retrieved May 17, 2008. ^ Shawki Barghouti (2006). ﻿Case Study of the Aral Sea Water and Environmental Management Project: an independent evaluation of the World Bank's support of regional programs﻿ (Report). http://water.worldbank.org/water/publications/case-study-aral-sea-water-and-environmental-management-project-independent-evaluation-w. Retrieved November 2010. ^ a b Ilan Greenberg (2006-04-07). "A vanished Sea Reclaims its form in Central Asia". Int. Her. Trib.. Archived from the original on 12 May 2008. https://web.archive.org/web/20080512082842/http://www.iht.com/articles/2006/04/05/news/sea.php. Retrieved May 17, 2008. ^ Ilan Greenberg (2006-04-06). "As a Sea Rises, So Do Hopes for Fish, Jobs and Riches". The New York Times. Archived from the original on January 5, 2015. https://web.archive.org/web/20150105011826/http://www.nytimes.com/2006/04/06/world/asia/06aral.html. Retrieved 2008-05-16. ^ "Miraculous Catch in Kazakhstan's Northern Aral Sea". The World Bank. June 2006. http://www.worldbank.org/projects/P046045/syr-darya-control-northern-aral-sea-phase-project?lang=en. Retrieved May 17, 2008. ^ "North Aral Sea Recovery". The Earth Observatory. NASA. 2007. http://earthobservatory.nasa.gov/Newsroom/NewImages/images.php3?img_id=17634. Retrieved 2008-05-17. ^ a b Martin Fletcher (June 23, 2007). "The return of the sea". The Times (London). http://www.timesonline.co.uk/tol/news/world/europe/article1975079.ece. Retrieved May 17, 2008. ^ a b Saghit Ibatullin (August 25, 2015). "Central Asia Must Unite to Revive the Aral Sea". http://thediplomat.com/2015/08/central-asia-must-unite-to-revive-the-aral-sea/. Retrieved May 23, 2016. ^ "Saving a Corner of the Aral Sea". The World Bank. 2005-09-01. http://go.worldbank.org/IE3PGWPVJ0. Retrieved May 17, 2008. ^ "The rehabilitation of the ecosystem and bioproductivity of the Aral Sea under conditions of water scarcity" (PDF). August 2007. http://www.boku.ac.at/iwhw/onlinepublikationen/nachtnebel/EU_INTAS_0511_Rebasows/Files/Summary_report.pdf. ^ "Strategies suggested for implementation". ICWC. http://www.icwc-aral.uz/strategy.htm. Retrieved January 6, 2013. ^ "IFAS". WaterWiki.net. http://waterwiki.net/index.php/IFAS_-_International_Fund_for_Saving_the_Aral_Sea. Retrieved April 4, 2010. ^ Bozheyeva, G., Y. Kunakbayev and D. Yeleukenov (1999). Former Soviet Biological Weapons Facilities in Kazakhstan: Past, Present and Future. Monterey, Calif.: Monterey Institute of International Studies, Center for Nonproliferation Studies. ^ Khabar Television/BBC Monitoring (November 20, 2002). "Kazakhstan: Vozrozhdeniya Anthrax Burial Sites Destroyed". Global Security Newswire (Nuclear Threat Initiative). Archived from the original on April 22, 2008. https://web.archive.org/web/20080422205925/http://www.nti.org/d_newswire/issues/newswires/2002_11_20.html. Retrieved May 17, 2008. ^ "Uzbekistan, intl consortium ink deal on exploring Aral Sea". ITAR-Tass. http://www.itar-tass.com/eng/level2.html?NewsID=10748305&PageNum=0. ^ Michael Hancock-Parmer (2010-06-09). "Aral Gas". Registan.net. http://www.registan.net/index.php/2010/06/09/aral-gas/. ^ "Psy". Kino Expert. http://www.kinoexpert.ru/index.asp?comm=4&num=5583. Retrieved September 18, 2009. ^ "Delta Blues (in a land of cotton)". YouTube. November 5, 2008. https://www.youtube.com/watch?v=0465vGRWhQE. Retrieved July 18, 2009. ^ Al Jazeera World. "People of the Lake". http://www.aljazeera.com/programmes/aljazeeraworld/2012/08/2012857324531428.html. Retrieved 4 December 2015. ^ "Watch Pink Floyd's Surreal, Sun-Baked 'Louder Than Words' Video". Rolling Stone. http://www.rollingstone.com/music/premieres/pink-floyd-louder-than-words-video-20141110. Retrieved 4 December 2015. Micklin, Philip (2007). "The Aral Sea Disaster". Annual Review of Earth and Planetary Sciences 35 (4): 47–72. DOI:10.1146/annurev.earth.35.031306.140120. Retrieved on May 17, 2008. Bissell, Tom (April 2002). "Eternal Winter: Lessons of the Aral Sea Disaster". Harper's: pp. 41–56. http://harpers.org/archive/2002/04/0079135. Retrieved May 17, 2008. Bissell, Tom (2004). Chasing The Sea: Lost Among the Ghosts of Empire in Central Asia. New York: Vintage Books. ISBN 978-0-375-72754-2. Ellis, William S (February 1990). "A Soviet Sea Lies Dying". National Geographic: pp. 73–93. Ferguson, Rob (2003). The Devil and the Disappearing Sea. Vancouver: Raincoast Books. ISBN 1-55192-599-0. Kasperson, Jeanne; Kasperson, Roger; Turner, B.L (1995). The Aral Sea Basin: A Man-Made Environmental Catastrophe. Dordrecht; Boston: Kluwer Academic Publishers. p. 92. ISBN 92-808-0848-6. (2004) "Indirect estimation of groundwater inflows into the Aral sea via a coupled water and salt mass balance model". Journal of Marine Systems 47 (1-4): 35–50. DOI:10.1016/j.jmarsys.2003.12.007. Retrieved on May 17, 2008. (2004) "Influence of the Aral Sea negative water balance on its seasonal circulation patterns: use of a 3D hydrodynamic model". Journal of Marine Systems 47 (1-4): 51–66. DOI:10.1016/j.jmarsys.2003.12.008. "Syr Darya Control & Northern Aral Sea Phase I Project". World Bank Group - Kazakhstan. December 2006. http://www.worldbank.org/projects/P046045/syr-darya-control-northern-aral-sea-phase-project?lang=en. This page uses content from the English language Wikipedia. The original content was at Aral Sea. The list of authors can be seen in the page history. As with this Familypedia wiki, the content of Wikipedia is available under the Creative Commons License.